Hannes Meyer,Originally published in San Rocco 6 / Collaborations. the second dean of the Bauhaus, is remembered as the one that drove the school to ruin. Supposedly his strong leftist sympathies had made the school inopportune for the German political climate of the time. Those Co-op theatre. 1. See Hannes Meyer, “My dismissal from the Bauhaus”, open letter to Oberbürgermeister Hesse, Dessau, 1930; and idem, “Bauhaus Dessau, 1927–1930: My Experience of a Polytechnical Education”, a survey in the Mexican periodical Edificatión, no. 34/1940. 2. Some of the biggest names include Siemens, AEG, Daimler, Fokker, and Opel. 3. The delicate relationship was also to the industrial capitalist system’s trouble handling inflation. A balance between labour and production modes could not be found, and this had already began to be apparent after 1923. It slowly led to the crisis and failure of the Weimar Republic, with the consequent seizing of power by the Nazi party. See Sergio Bologna, “Class Composition and the Theory of the Party at the Origin of the Workers–Councils Movement,” Telos, no. 13 (Fall 1972): 4-27 and Antonio Negri, Operai e stato: Lotte operaie e riforma dello stato capitalistico tra rivoluzione d’ottobre e New Deal, (Milan: Feltrinelli, 1972). 4 From the article “Die neue Welt” that Meyer published in 1926 in ABC Beiträge zum Bauen [Contributions to Building], an architectural magazine founded in 1923 by Hannes Meyer, Hans Schmidt, Mart Stam and the Suprematist El Lissitzky. in power disliked him because he openly sympathized with Marxist ideology and the German Social Democracy that had just entered the political scene in the turbulent transition from a Wilhelmine Germany to the Weimar Republic. But few know that during the very short time he was in charge of the Bauhaus – from April 1927 to July 1930 – he turned the school from an elite educational institution into a more egalitarian and productive place of learning that was directly connected to industry. The school had become financially profitable and students worked together in brigades that catered to mass industrial modes of production. His goal was to transform the collective potential of co-operation in architectural production from a political concept into a functional tool as a means of rescuing the working class from capitalism. Meyer perceived architects as labour, and for him, co-operation was both a collective mode of production and the link between the product itself – architecture – and its producer – mass society. In those years Germany was still leading in the development of industrial machinery thanks to strict collaboration between research and labour, as well as an extremely dynamic marketing apparatus. A boom in skilled and educated labour had enabled the emerging working class to self-organize through labour unions, but also engendered a delicate relationship with their representative Social Democratic party. Right after World War I, at the end of the German Spartacist revolution, the party took part in the government for the first time in 1919. Thanks to industry, proletarian power was growing and the working class was gradually becoming conscious of its rights and potential. A new dimension of the collective subject – backed up by intellectuals – was emerging. This was fuelled further by scientific research, which confirmed the cultural and social movement toward the collective dimension. The scale of the world was starting to decrease faith in the uniqueness of the individual: in January 1921, Albert Einstein startled Germany by postulating the possibility of measuring the universe. In Meyer’s words, “Co-operation rules the world. The community rules the individual”. He sincerely believed that co-operation was the most valuable alternative social structure, one founded not on the production of surplus value, but on the collective needs and desires of the mass society that produced it. His thought was strongly characterized by the collective aspects of producing and learning together. He strove to introduce the working class to the liberating potential of co-operation, and also used it to problematize collective work in the debate about the role of the architect in the industrial world. On the one hand, his purpose was to tune the shortcomings of functionalism – criticizing the ones who embraced technological modernization but not the social consequences of it. And on the other hand, Meyer used co-operation to counter teaching’s inability to connect with industrial production and to eliminate the artistic and authorial aspects of arts-and-crafts-style production. Contemporary to Meyer many others were working on the same theme, and the ones who were probably closest in their thinking were Bertolt Brecht and Erwin Piscator.5. “For us, man portrayed on the stage is significant as a social function. It is not his relationship to himself, nor his relationship to God, but his relationship to society which is central. Whenever he appears, his class or social stratum appears with him. His moral, spiritual or sexual conflicts are conflicts with society.” Erwin Piscator 1929, “Basic Principles of a Sociological Drama”, in Modernism: An Anthology of Sources and Documents, ed. V. Kolocotroni, J. Goldman and O. Taxidou (Chicago: The University of Chicago Press, 1998). In 1926, Brecht’s collective premiered Mann ist Mann (Man Equals Man), a play that stressed collectivity and downplayed the individual by exploring the human personality as something that can be dismantled and reassembled like a machine. For Meyer – in the context ferment of German industry – the production method should have been closer to social needs in terms of both process and output. He believed that the goal of an architect was to organize the interpenetration of technology and the collective body by way of co-operation in order to merge the authorial action of the architect into a more egalitarian and collective process. In this way, the architect himself turns into an organizer and becomes a specialist by eliminating the paradoxical separation of the artist from other kinds of workers, thereby articulating architecture’s melding of art and life. The architect has the knowledge to improve the design process and bring together social needs and technology in order to assemble an object made up of use values and visual codes already consolidated by society. Such a process is structured by continual author-free architectural production. In other words, with the organizational support of the architect, society produces its own architecture. At this point the architect’s control is hardly discernable in the reciprocal interplay of action and potential between society and built matter. At different moments, architecture and the collective body become one another’s subject or object. This suggests a twofold interpretation of co-operation between architecture and man.6. See Meyer, “Die neue Welt”. The way in which Meyer used co-operation as an architectural design tool in the context of the mass society generated by industry can be interpreted in two ways. The first one is explicit and involves the issue of co-operation among individuals; this is the one that is consistently applied by Meyer in his teaching and his practice of his profession.7. See Hannes Meyer, “How I Work”, Architektura CCCP, 6 (1933). The second is more implicit and relates to mass society. These two perspectives can be read as complementary sides of the same tool. In 1924, Meyer designed the Swiss pavilion for the International Exhibition of Co-operatives in Ghent.8. K. J. Winkler, Der Architekt Hannes Meyer: Anschauungen und Werk (Berlin: VEB Verlag für Bauwesen, 1989). The space was meant for co-operative propaganda through “popular education” using folks culture. Meyer imposes “the simplest simplicity” in the expression of abstraction to convey the message about co-operation. In this manner he could at the same time promote co-operation among the individuals comprising mass society, as well as co-operate with them through “the education of new vision and perception” to stir them to become more politically aware. At one end of the exhibition space was the co-op vitrine. Co-op vitrine. 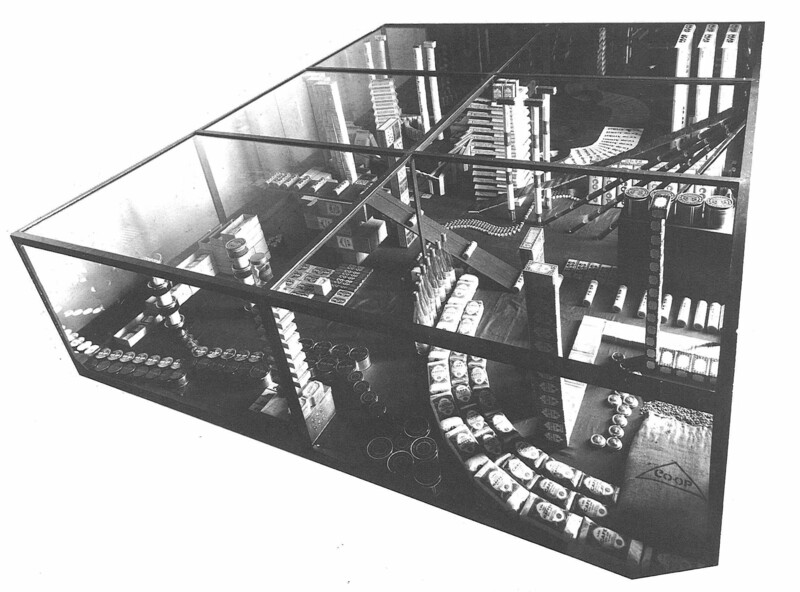 The showcase consisted of a large glass box like a shop window offering thirty-six standard items of co-operative production and co-operative trade. The collection of co-op products symbolizes a production that has grown out of the alienation of the capitalist market economy and ownership, demonstrating how co-operation can disenthral man from capital. Products are arranged in a clear spatial composition and clearly recall the form of repetition of industrial mass production, for they are stacked and arranged as if at the end of production assembly lines. No product is individually displayed; rather each is presented as part of a group with no centre while nonetheless remaining individually recognizable. People entering the pavilion could admire the vitrine at any time of the day. At night, however, at the other end of the exhibition space the curtain rose on co-op theatre. With the “co-op theatre”, Meyer aspired to use short scenes to eliminate human emotion by displaying “body-games, glimpses of light, colours, movement, noises and music from a gramophone”. 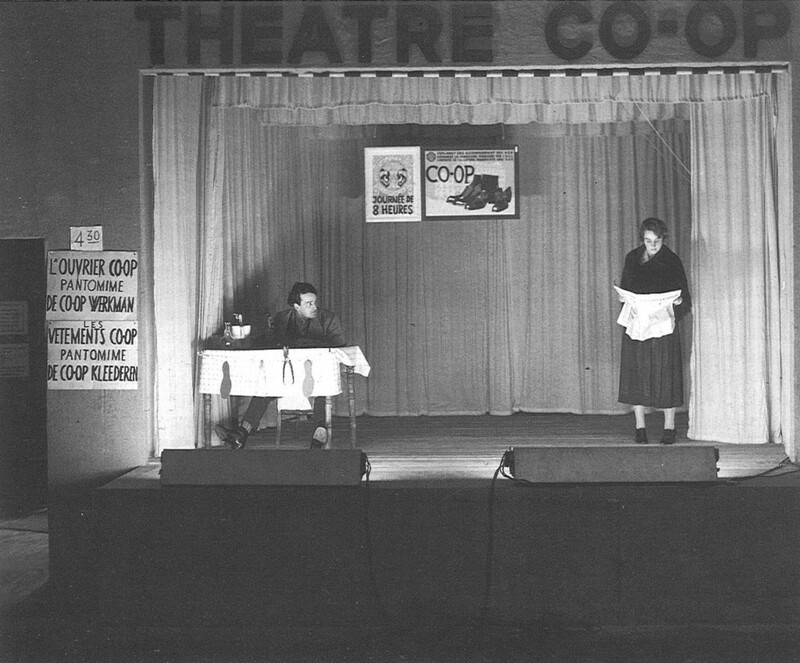 The plays were mute pantomimes that described the idea of the co-operative to demonstrate its benefits. Meyer wrote the scenes himself, touching upon the core elements of the co-operative ideology: work (private enterprise and wage labour); clothes (a man finds happiness in the co-op clothes); dream (about the possibility of different conditions); trade (cutting out the middleman). The actors’ performance incorporated life-size puppets in order to suggest the opposition of man versus dummy, co-op versus anti-co-op. By way of this simple pairing, the audience was confronted with the contrast between the real emotions and natural movement of a freed man and a puppet symbolizing a man that does not emancipate himself by means of co-operation. With the co-op theatrical performances Meyer was precociously experimenting with upcoming developments in experimental theatre, for his four pieces had a clear pedagogical purpose. Thus the education of working class was a relevant issue in socialist debate, and theatre became a useful means of exploring it once the world of theatre had been freed from the bourgeoisie. In 1926, Bertolt Brecht started developing his idea of “epic theatre”, which was designed to provoke rational self-analysis and a critical view of the play rather than emotional identification. Since epic theatre was supposed to instruct its audience, Brecht also called it instructive theatre, and in his Lehrstücke (learning-plays) spectators were no longer in any way allowed to experience the show uncritically or without an understanding of its practical consequences through the overly simplistic means of feeling empathy for the characters in a play. Brecht’s plays were aimed to affect those engaged in the performance, mainly the actors, most of all, but also the spectators. In a Marxist way, “instructive theatre” was art for the producer, not the consumer. The production of the performance subjected the content and the events portrayed to a process of alienation. This was what Brecht called the “Small Pedagogy”: the alienation that is necessary to all understanding, or verfremdungseffekt. While the “Major Pedagogy” made the Lehrstücke turn its audience into participants during the performance process. Plays were used as operative political training. By copying the behaviour of the characters in the play, the participants rehearsed how to think and act collectively.10. Bertolt Brecht, “The Modern Theatre is the Epic Theatre: Notes to the opera Aufstieg und Fall der Stadt Mahagonny,” in Brecht on Theatre: The Development of an Aesthetic, ed. and trans. John Willett (London: Methuen, 1964) Bertolt Brecht, “The Modern Theatre Is the Epic Theatre” (1930). See also Meg Mumford, Bertolt Brecht (London and New York: Routledge, 2009). 11. These included his works of Theater Co-op, Vitrine Co-op, Lino Co-op, Photo Co-op, Interior Co-op. With Brecht, the stage became a means of instruction, and this is what Meyer tried to do with architecture. Thanks to the various co-op projects of his first experimental phase, Meyer already defined co-operation as the reciprocity between modes of production and modes of perception that he will develop in what we might call “epic architecture”. In all his designs, he elaborates a new relationship between the building, its non-author – the architect and other specialists – and the collective subject. For him building is no longer an individual task in which architectural ambition is realized; rather, “Building is a joint undertaking of craftsmen and inventors . . . Building has grown . . . into a collective affair [of individuals]”.12. See Meyer, Die neue Welt. See also VOPRA (All-Russian Society of Proletarian Architects), Statements #10 and #11. Plan of the Bernau school, redrawn by the author. Meyer always started a project by drawing a diagram that reflected his assumption that architecture is part of a system of production, re-production and consumption. For him, this system exerts an influence over individuals, while the collective subject has an influence on the diagram that generates the project. This concept of a double relationship partly anticipates the distracted perception of the detached Parisian flâneur described by Benjamin. The difference is that Meyer aims to achieve a more conscious involvement with a sense of engagement powered by the collective. In fact, all of Meyer’s designs – from the Petersschule to the League of Nations to the Bernau School – are dedicated to the collective engagement of mass society. The task underlying these designs is to nurture co-operation as a means of both influence and perception. Such works best demonstrate how Meyer’s work unpacks both the explicit co-operation among individuals within mass society, and the implicit one between mass society and architecture. Among the three mentioned projects, the only one that Meyer succeeded in completing is the Federal School of the Federation of German Trade Unions in Bernau (1928–30), a project he won through a competition. 13. Martin Kieren, Hannes Meyer: Dokumente zur Frühzeit Architektur und Gestaltungsversuche 1919–1927 (Heiden: A. Niggli, 1990). Meyer could finally flesh out his co-op ideology. The client supported Meyer’s co-operative intentions and the building construction was even funded by four and a half million members of the union, who each contributed fifty pfennings. 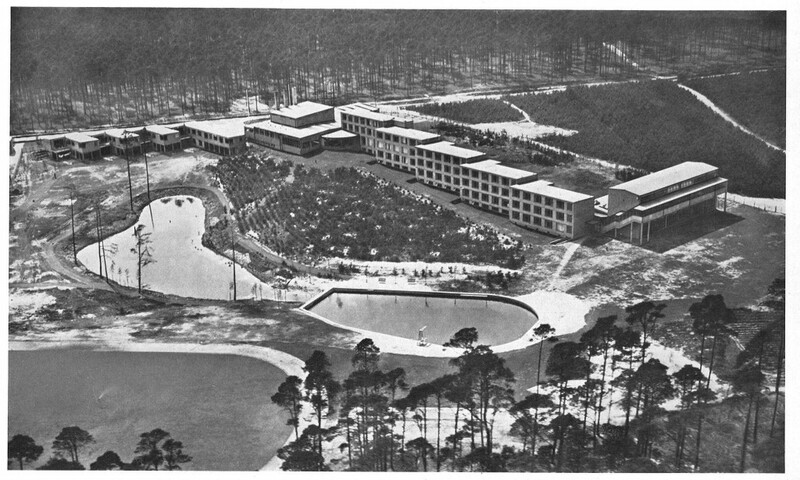 At the time, the federation united more than eighty percent of all the unions in Germany, and the school was thought of as an institute of educational excellence for workers just as the Bauhaus was for designers. Lessons were intended to allow volunteers from the unions to benefit from further education for a short period, and the most common subjects of study were trade unions, management, economics, insurance and labour law, and industrial hygiene. Meyer worked on this project with a group of students from the Bauhaus. He had won the competition thanks to a proposal about a new form of socio-educational organization designed to stimulate comradeship based on a division of the 120 students into twelve cells of ten people each. 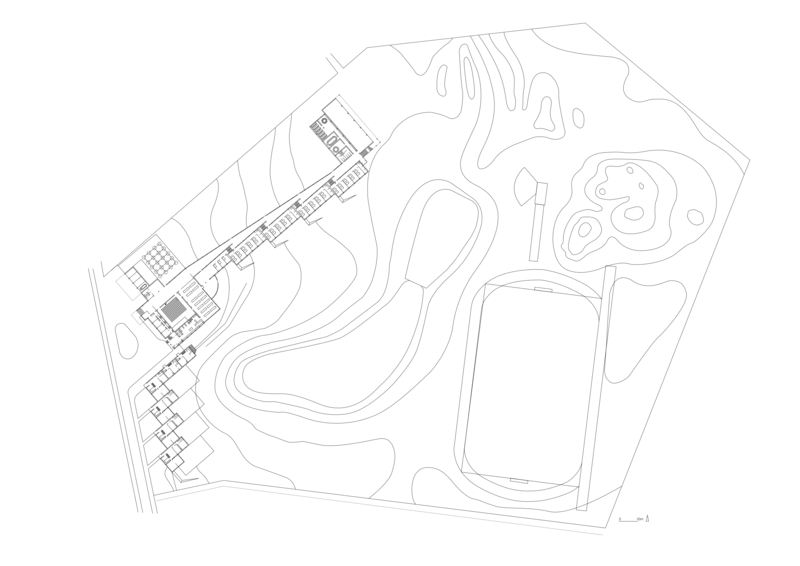 Thus the diagram at the origin of the school’s design is marked by the dialectics of internal material determinations – programme, standards, hygiene – and external socio-educational ones. It results in a linear arrangement organizing the various uses of the complex into three distinct yet interconnected components. The first building hosts most of the public functions and is connected to a residential zone of four dormitories. It terminates with a two-storey building with a wide staircase connecting a gymnasium and classrooms. A long steel-and-glass corridor slopes down, following the landscape and serving as an interior passage linking the complex’s components, and ends at the wide staircase. The steel used in the construction of this passage as well as in the winter garden and the gymnasium staircase is painted red, contrasting sharply with the gray concrete structure and buff brick of the exterior.14. Winkler, Der Architekt Hannes Meyer. The vibrant red signalled the principal circulation path, but also an informal space in which to meet. It is one of the building’s most prominent public spaces and external features, and it emphasizes the underlying functional diagram. In this project the collective spaces embody a significant mass psychological factor that attains the sought-after dimension of collective life, shared production and self-valorization for the Federation’s students. Unfortunately, the ideal context for co-operation created at the Bernau School was soon interrupted by the war. The Nazi party confiscated the institute only three years after it had opened and converted it into an SS training facility. After the war, the East German Trade Union Federation reused it again as a training facility, but later on the buildings were left vacant and eventually abandoned. Following the reunification of Germany that began in 1989, the building was found in very bad shape, and a restoration effort sponsored by the regional government of Brandenburg in partnership with a new occupant, the Handwerkskammer (Chamber of Crafts) Berlin, began in 2001.15. See Morris H. Hylton III, Modernism at Risk: Modern Solutions for Modern Landmarks, an exhibition organized by the World Monuments Fund. Analyzing how Meyer focused on establishing a relationship with the contemporary collective subject of his day – mass society – can provide insights into how to relate the collective subject of today: the multitude. In his co-op works, Meyer deconstructed architecture in terms of its material determinants and the social conditions of its making. For him, architecture had to be produced within society and disassociated from capital. It could be argued that Meyer tried to find the link between the production of architecture and Karl Marx’s concept of the production of man and society: “Just as society itself produces man as man, so is society produced by him.”16. Karl Marx, Economic and Philosophical Manuscripts, Third Manuscript , Ökonomisch-philosophischen Manuskripte, Translated by Martin Milligan (New York: Prometheus Books, 1988). 17. “The multitude is a whole of singularities and communication and co-operation are fundamental to its essence.” Antonio Negri, “Pour une definition ontologique de la multitude”, Multitudes 9 (May–June 2002). Like mass society, the multitude is a subject of production, but its co-operative power is exploited by capital. In general, co-operation is an autonomous power typical of collective subjects and is a mode of production that has to be reclaimed from the claws of capitalism. The crucial aspect of the architecture of the collective subject is that Meyer had already used material diagrammes to “organize” the potential of collective immaterial production18. See Branden W. Joseph and Alessia Ricciardi, “Interview with Paolo Virno”, Grey Room, no. 21 (Fall 2005) and Maurizio Lazzarato “Immaterial Labour”. and the self-valorization of mass society, something that was largely underestimated at the time. Thanks to Meyer’s stress on co-operation, architecture was not produced by a diagram mapping only material factors. Rather, his application of both material and immaterial factors in the development of diagrams is the opposite of today’s tendency to create a “diagram of everything”.19. “Maybe, architecture doesn’t have to be stupid after all. Liberated from the obligation to construct, it can become a way of thinking about anything – a discipline that represents relationships, proportions, connections, effects, the diagram of everything.” Rem Koolhaas, ed., Content (Cologne: Taschen, 2004). Opposing this co-op architecture is the organization of a non-bureaucratic process that both produces effects upon and is generated by the collective subject in ways that would not be possible without a design. In other words, co-operative architecture entails reorganizing an organized form of existence. It alternates phases of organization and of spontaneity20. Rosa Luxemburg’s theory of dialectic of spontaneity and organization argued that the two are not separable or separate activities, but rather different moments in the same political process; one cannot exist without the other. See Rosa Luxemburg, The Rosa Luxemburg Reader, ed. Peter Hudis and Kevin B. Anderson (New York: Monthly Review Press, 2004). by letting the collective subject implicitly co-operate with architecture and foster explicit co-operation among its individuals. Bertolt Brecht, “The Modern Theatre Is the Epic Theatre” (1930). Martin Kieren, Hannes Meyer: Dokumente zur Frühzeit Architektur und Gestaltungsversuche 1919–1927 (Heiden: A. Niggli, 1990). Rem Koolhaas, ed., Content (Cologne: Taschen, 2004). Rosa Luxemburg, The Rosa Luxemburg Reader, ed. Peter Hudis and Kevin B. Anderson (New York: Monthly Review Press, 2004). Karl Marx, Economic and Philosophical Manuscripts, Third Manuscript , Ökonomisch-philosophischen Manuskripte, Translated by Martin Milligan (New York: Prometheus Books, 1988). Hannes Meyer, “Bauhaus Dessau, 1927–1930: My Experience of a Polytechnical Education”, Edificatión, no. 34 (1940). Hannes Meyer, “My dismissal from the Bauhaus”, open letter to Oberbürgermeister Hesse, Dessau, 1930. Hannes Meyer, “How I Work”, Architektura CCCP, 6 (1933). Meg Mumford, Bertolt Brecht (London and New York: Routledge, 2009). Antonio Negri, “Pour une definition ontologique de la multitude”, Multitudes 9 (May–June 2002). Erwin Piscator 1929, “Basic Principles of a Sociological Drama”, in Modernism: An Anthology of Sources and Documents, ed. V. Kolocotroni, J. Goldman and O. Taxidou (Chicago: The University of Chicago Press, 1998). K. J. Winkler, Der Architekt Hannes Meyer: Anschauungen und Werk (Berlin: VEB Verlag für Bauwesen, 1989).